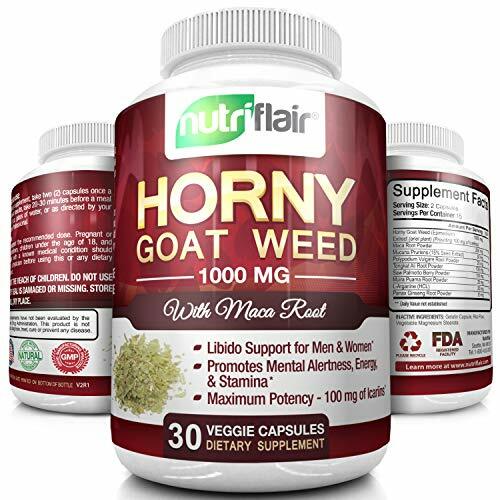 What Is the Best Horny Goat Weed Supplement Brand in 2019? Horny goat weed has been used for more than 2000 years in traditional Chinese medicine. True to its name, its primary use has been to increase libido in men and women, and also to relieve the symptoms of PMS and menopause in women. Horny goat weed is an herb which grows wild in regions of China. It is most abundant at higher altitudes. Traditionally, the leaves of the horny goat weed were used to make an infusion for drinking. The active ingredient, icariin, is a flavonoid compound which helps to give plants their color. With scientific research to substantiate its efficacy, we thought it was worth investigating further. Certified by the USDA as organic, this powder has a high concentration of icariins to boost libido. A resealable foil zip bag ensures freshness is maintained. Guaranteed to be 100 percent pure horny goat weed. Supplemented with muira puama, maca root, saw palmetto, tongkat ali and L-arginine for maximum strength. Horny goat weed combined with eight additional organic ingredients that are included to boost testosterone levels. A supplement suitable for both men and women. It contains additional ginseng and saw palmetto to boost libido. 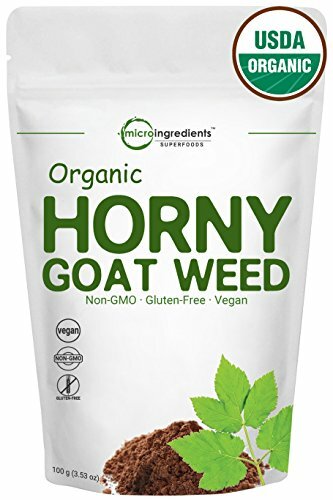 Who Needs Horny Goat Weed? Now widely available as a supplement, horny goat weed extract has been proven to produce many other positive effects on the heart, bones, brain and nervous system, kidneys, mental health and hair loss. It also has potential anti-ageing properties. Does It REALLY Make You Horny? The short answer here is… yes! The effects of horny goat weed were first noticed by the goat-herders living in the mountainous regions of China. The misery of PMS is familiar to women around the world. Symptoms can be severe – sometimes debilitating – and include abdominal pain, back pain, joint and muscle pain, acne, tiredness, headache and difficulty sleeping. Similarly, going through the menopause can be an unbearable time, with hormones bouncing around all over the place, and a variety of unpleasant symptoms. Those most commonly recognized include hot flushes and mood swings. We all need our bones to support us. They act as anchor points for muscles to allow them to operate the lever mechanisms which we rely on to move. Keeping our bones healthy and strong is essential to maintain a good quality of life. A weak bone structure increases the risk of breaking bones and suffering avulsion fractures (where muscles tear away from the bone and take some of the bone with them). Very few people manage to participate in regular sport and exercise without sustaining some kind of injury occasionally. Tendon injuries are very common, can be difficult to rehabilitate and can cause a lot of down time. Statistics show that over 15 million people in the US have been diagnosed with depression. Many more of us experience low mood at some point in our lives. Our nervous system is what makes us function. Without it, nothing else in the body can do its job. The kidneys are essential for health. They are our blood filtration system, disposing of internal waste products in the form of urine. According to the American Hair Loss Association, thinning hair and baldness affects around 65% of men in the US by the time they reach the age of 35. The recommended dose for horny goat weed varies between 1000 mg to 2000 mg daily. Most manufacturers state that their product is not intended for use during pregnancy and by nursing mums, so seek medical advice before taking. 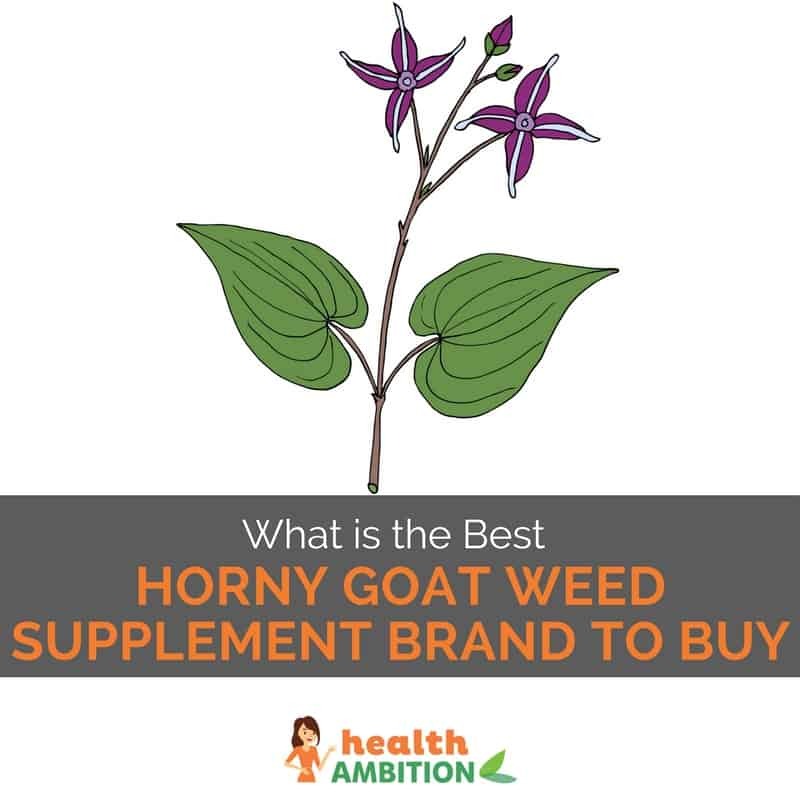 What is the Best Horny Goat Weed Supplement? 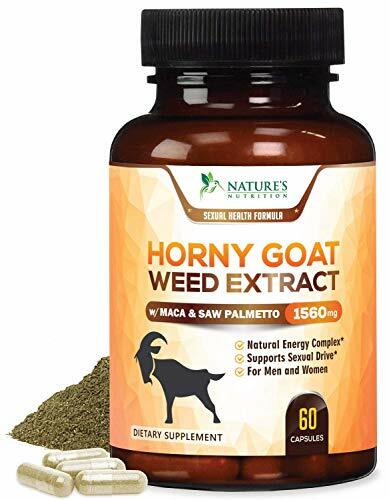 With so many proven health benefits associated with horny goat weed extract, and so many different brands now widely available, we decided to make things simple. We’ve reviewed five of the most popular brands currently on the market to help you make an informed choice. We have included both capsules and powders in our review. Some people like the convenience of taking a capsule, while the powders provide great value for money and are more suitable for people who have difficulty swallowing capsules, and are easy to add to your preferred beverage or smoothie. This product is very high-quality, attractively packaged, and users report excellent results with very few negative points. Interestingly, users did not report any off-putting taste. 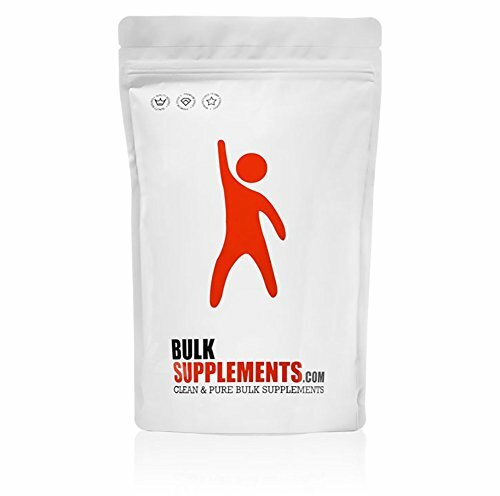 BulkSupplements is a well known brand offering high quality products at competitive prices. Their Pure Horny Goat Weed powder many good points and very few negatives, and it’s the most competitively priced product we reviewed. Some users say the taste is off-putting; others say this is manageable by mixing it into a smoothie. Nutraflair offer a good quality product with the added bonus of other performance-enhancing ingredients, and most users report good results. However, the inclusion of gelatin makes this product unsuitable for vegetarians and vegans. 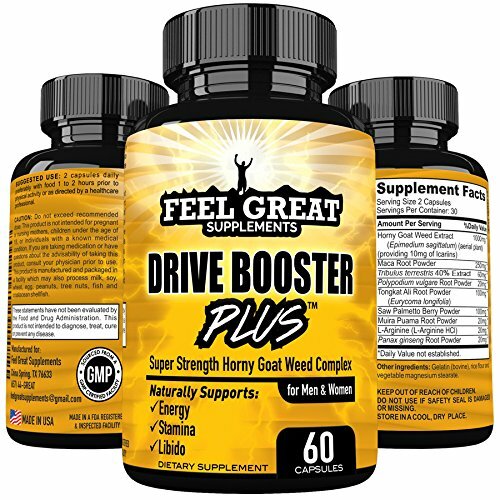 This horny goat weed extract offers 1000 mg per serving with 60 capsules per container. It is made in the USA in a GMP facility. The only downfall is some users didn’t feel it produced any effect. A product which has been designed for both men and women, which could mean saving the expense of choosing two different supplements. For the men, it will revitalize in and out of the bedroom. Mental cognition can increase, energy levels will rise and can help to restore ailing libidos. This is further enhanced by the inclusion of Maca root extract. The ladies benefit too. It will balance estradiol and estrogen levels, providing a feeling of wellness and alertness. Made in the USA, it has been tested by a third-party laboratory to ensure for quality and strength. Can be hard to swallow. When it comes to horny goat weed extracts, my favorite is Micro Ingredients Organic Premium Horny Goat Weed Extract Powder. It is high quality, organic, suitable for just about every diet, and contains no additives and preservatives. The powder form means it can easily be added to your favorite smoothie – a plus for those who struggle to take capsules. Add the excellent value for money into the bargain, and we hope you can see why we chose it as our winner! Does Weed Make You Fat? What Is the Best DIM Supplement in 2019?